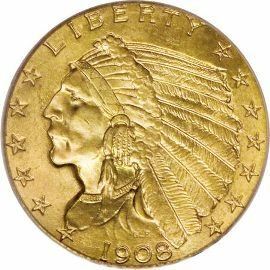 The Indian Head Quarter Eagle was designed by Bela Lyon Pratt and was made at the US Mint from 1908 thru 1929. 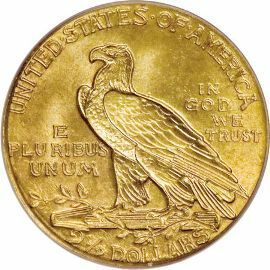 These gold coins, along with the half eagle denomination, stand alone as the only US coins with an incused design. This technique was used to discourage counterfeiting and reduce wear on the coins. However, this particular design is one of the most copied in the US coin series. appear on the left side, and seven on the right, signifying the 13 original colonies. The reverse features an American eagle perched atop a bundle of arrows, and clutching an olive branch in its talons. Inscriptions read "UNITED STATES OF AMERICA" across the top, "E PLURIBUS UNUM" on the left, and "IN GOD WE TRUST" to the right of the eagle. Also, the denomination "2 1/2 DOLLARS" is at the base of the coin.